In this excerpt, Clinton Hart Merriam, naturalist and ethnographer, meets up with John Campbell Merriam, paleontologist, to explore Potter Creek Cave, of which C.H. 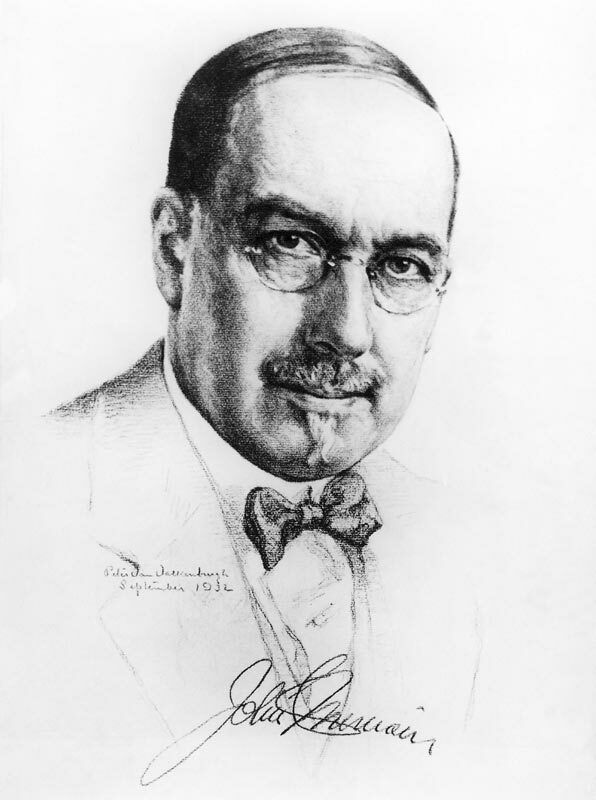 Merriam had been sought to help identify mammal bones from the excavation. Forty-seven years old at the time, our protagonist must crawl on his belly through a narrow opening and then descend into the "abyss" to witness the treasure-trove of bones. July 20, 1903. Clear and warm. 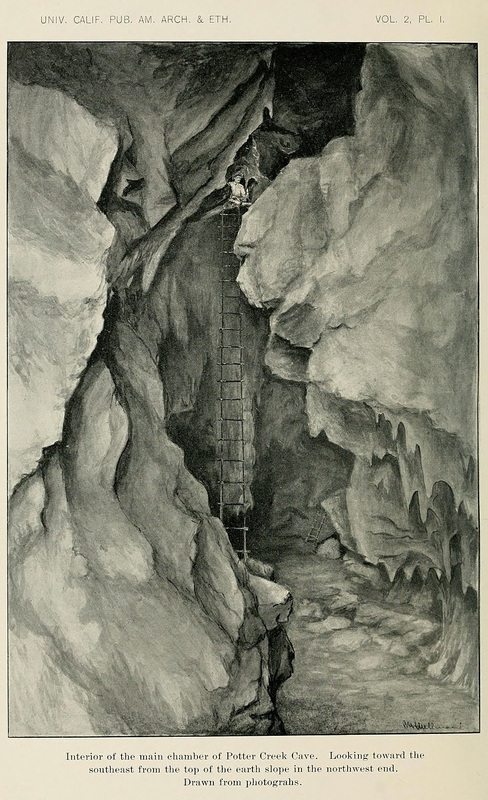 Went in morning with Dr. J.C. Merriam and his assistants, Sinclair and Worcester, to the bone cave in the blue limestone mountain back of camp. The cave is on the south end of face of the mountain about ___ [space is left blank, perhaps to return and fill in at a later time] feet above the River at Baird and about 2 miles from camp. The trail leading up to it winds up in a southeasterly direction from the bend of the River and keeps in the shade of oaks and pines and tall brush most of the way. It finally comes out on a limestone knoll facing the south and west and covered with Upper Sonoran chaparral – Hippocastanum californicum, Ceanothus cuneatus, Eriodiction glutinosum, Gavya?? ?, Rhus ?? ?, Rhamnus ilicifolia. Digger pines (P. sabiniana) here replace the Ponderosa pines of the wooded base of the mountain. This lower forest – which fills McCloud Valley and spreads over the easterly and northerly slopes of the adjacent mountains – consists chiefly of black oaks (Q. californica), white oaks (Q. garryana), mountain live oaks (Q. chrysolepis common and Q. wislizeni less common), Ponderosa pines (P. ponderosa), ??? pines (P. attenuata) with very few sugar pines (P. lambertiana) and Douglas fir (Pseudotsuga ???). I have not seen any Libocedrus or Abies or Juniper. Along the river and in the numerous gulches maples are common, and tree alders and ash also, and California bay trees of fair size (30 – 40 or even 50 feet high) are plenty, and dogwood (Cornus nuttallii) abounds. Three dogwoods and three maples occur here along the river – 1 tree and 2 bush forms of each. The dogwoods are Cornus nuttallii, C. sessilis, and C. glabrata. The maples are Acer macrophyllum, Acer circinatum, and Acer glabrum. The moist gulches, many of which carry small streams, are often choked with ferns and the beautiful vine maple (Acer circinatum) and almost equally attractive C. sessilis, whose large deeply veined shiny green leaves and conspicuous oval berries of red, black and white are always beautiful. Beds and islets of the umbrella-leaf water saxifrages (Peltiphyllum peltatum) adorn the river. Madrones are said to occur here and there but I have not seen any. At the river bend at Baird Opulaster capitatus and Zauschneria grow. The mouth of the cave is a large half dome opening or cavern facing the southeast. Here we ascended a short ladder and walked a little way in a narrow passage, and then got down on our bellies and crawled through a low tunnel and came out in a narrow chamber from which a dark passage leads to a fearful black hole. A rope ladder, fastened above to a big stalagmite pillar, drapes vertically over a rock shelf into the abyss below. Sinclair went down first with a candle and held the rope below while I climbed down. My courage was improved by another rope, tied around my body just under the arms, which was given a turn around the stalagmite and kept taut while I went down. The most trying moment was getting over the edge of the shelf and actually setting out on the downward drop in the dark. When I climbed up, this same rope, steadily hauled in by a stout Indian, was one of the greatest comforts I can remember. The distance vertically down the rope is 48 feet which is sufficient for gymnastic purposes. The main cave is not very large but has several chambers at different levels. It has an earth floor, alternating with layers of stalagmite, which they have blasted. Bat skulls and bones are common on top. In the lower layers of the ground floor I dug out a few parts of skulls and jaws of Neotoma and Thomomys. This is the cave from which came the great collection of fossil bones Dr. J.C. Merriam brought to Washington last winter and which I helped identify. There still remains much unworked earth – enough to keep the boys busy some months. ??? represents words that were unable to be transcribed. In some instances, species names have changed since the date of recording. In this text, Clinton Hart Merriam receives thanks for his identification of many of the mammals found in Potter Creek Cave. Man and Pleistocene Fauna at Potter Creek Cave, California (Payen and Taylor, 1976) via JSTOR. Special thanks to Peter Crook for this transcription of Merriam's journals and for his many hours of volunteering at the Museum.